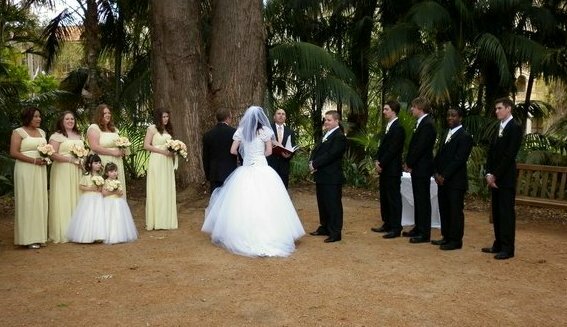 As sweet as cinnamon: Wedding in W.A. ready to fly to Perth W.A. for thier eldest brothers wedding. The Wedding Quilt is finished and all ready and packed. I made a Schnibbles Plan C quilt. Made in the Bride and Grooms favorite colors. I love this pattern, it turned out so easy to make. the watched the bride get all pretty too. Oh she was stunning in her beautiful dress. Here are Miss J and MissK with the bride, Smile for the camera. Then they walked towards their Brother, the Groom. They waited very patiently while the bride and groom got married. so romantic..so happy..so in love! The setting was gorgeous and perfect for a spring wedding. along with all the bridesmaids and flowergirl dresses. Something old for sure,and totally amazing. Until the next wedding......in November. We had a brilliant time in W.A. 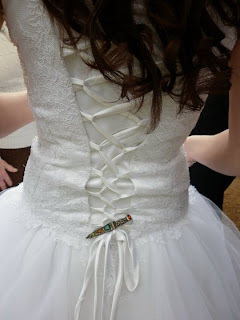 200yo kilt pin and the loving look in the groom's eyes. Thankyou for sharing this wonderful day! Sue has said it all perfectly. Lovely photographs Dawn. I bet they were over the moon with the quilt you made for them. Oh How beautiful the girls all looked. The Bride Bridesmaids and of course the little Flower girls.Also your son is a handsome fella.thank you for shring the wedding. Their wedding Quilt is just beautiful. I bet they loved it. 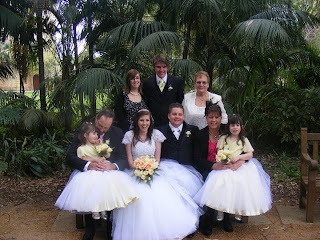 The Quilt , the girls , the brideand groom, everything is lovely and a very fresh relaxing post. Congratulations to the Happy couple and the Flowergirls . You all looks so lovely. You must be a very proud mum. Everything Is Beautiful I love the quilt They will treasure it forever. Oh, how pretty and sweet. Darling girls, beautiful bride. Gorgeous dresses. Much happiness! Beautiful!!! wonderful location too from the way the photos look. Felicidad a los novios que bonito y emotivo,me ha emocionado.gracias,un saludo. Beautiful wedding and wonderful memories for everyone. Thanks for sharing your pictures! A beautiful post Dawn! I love the pic of your girls with the bride. The bridal party dresses are just amazing. Yes, one very talented Granny! And the Wedding Quilt is perfect. The whole wedding party is gorgeous!! What a lovely family you have and what a perfect day!! beautiful thing to go to a wedding, especially if it is to that of a brother? I'm glad for you that you enjoyed it. Woe: that looks wonderful. Good luck and lots of happiness for your familiy! Oh, what a special time. All the girls look gorgeous. I love that Scottish pin in the brides dress. 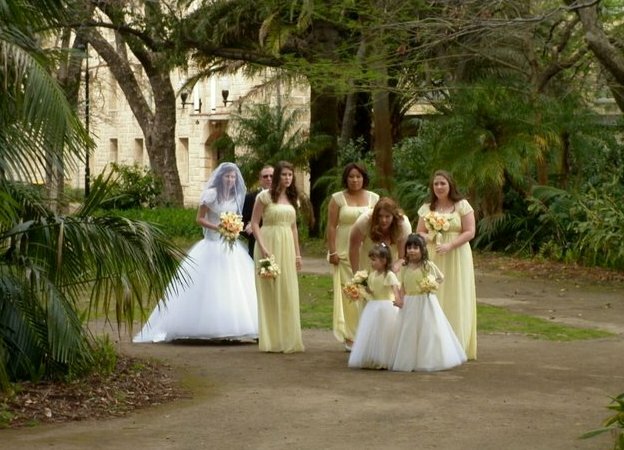 Beautiful wedding dresses and those little girls are soooo cute. The females in the wedding party, wearing lemon and white,looked like lovely roses, amongst all that greenery :). Oh Dawn, how absolutely beautiful. Every photo looks stunning and everyone so happy. What a beautiful day. Congratulations! Thanks for sharing your beautiful family.Everything is absolutely gorgeous! So beautiful...dresses, the girls...the pictures! Gorgeous Pics Dawnie and a Gorgeous family....... The quilt is lovely - I bet they loved it. simply stunning Dawn....I bet you had a tear in your eye!!!! Muy linda ceremonia. Felicidades a los novios y también para ti. El quilt está precioso. Muy lindas telas elegiste. Tan elegante y novedoso los colores. Everyone in the wedding looked beautiful! Love the quilt! B.E.A.UTIFUL!!!! THank you for sharing your son's special day with us Dawn - it's put a lovely mushy warm smile on my face!!! Wow - the dresses were stunning and all made by one lady - gosh she's a talented one! Just like you sweetie - but the one thing a grandma has that a mum doesn't have is more "time"! Gorgeous photos sweetie!!! Lovely wedding Dawn, thanks for sharing the photos. Everyone looks beautiful. What a gorgeous wedding! Congratulations to the bride and groom! The flower girls were delightful. Thank you for sharing this magical moment. 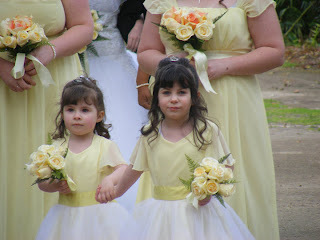 What a lovely wedding for your family, your girls are gorgeous! Gorgeous dresses, how clever is Granny. Hope you had a lovely day.